Eileen is a little bun of fun. A tight mounding Dianthus that forms a dome of prickly blue/green foliage 8″ wide and just 2″ tall. In May-June this foliage is obscured by a solid mass of brilliant pink flowers. They emit the treasured clove fragrance so loved in this genus. A first rate rock garden perennial, or for troughs or even amenable with drainage to the front of borders, dry gardens and even Hellstrips. 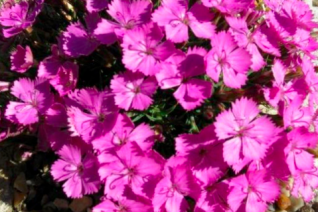 Gritty soil is what most dianthus buns crave, and you can achieve this by simply amending the soil with a handful of sharp gravel. Otherwise this cuties is adapted to not many nutrients but must have full sun. Light consistent summer irrigation makes the slowly expanding bun speed up. Just a touch. Not difficult and stunning in bloom. Buns, we love the buns of fun. Thanks Eileen. Evergreen. Cut off spent flowers for a clean and neater appearance. Very good to try where bunnies and deer are an issue. They tend to completely overlook this plant. Long lived perennial. Adorbs rock garden Dianthus with fine deep green foliage forming rounded mounds. In late spring to summer 8″ stem support feathery intensely fragrant white flowers. They come in a mass and are fragrant of cloves many feet away. It makes a great cut flower for small arrangements. To 8″ across for full sun and sharp drainage and light consistent summer water. Rock gardens, troughs, slopes. Easy to grow rock garden variety. She’s a strange one this Chomley. 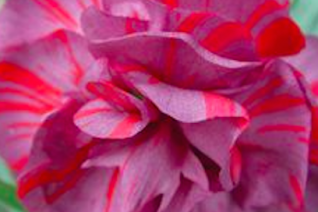 Found in a garden in Ireland this amazing carnation is astounding in the color of the flowers. Completely GRAY fully double flowers are streaked throughout with hot pink. I remember several raves in this color realm. Amazing cut flower and easy to grow border perennial. The long stems support the flowers in a vase nicely, but not necessarily when in the ground. Expect some flop. Full sun and average to rich, well drained soil with low/regular summer water. Blooms May-July. To 18″ tall and a little wider. Gray blue foliage is evergreen in our climate. Wowza, Carnations on acid. 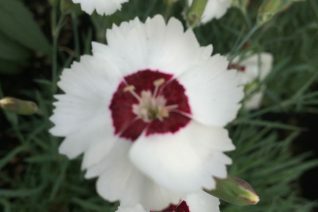 Green flowers are at a premium in the garden and green flowers with tremendous fragrance on long stems for cutting- well we have this somewhat rare Dianthus to fit that regime. Blue/green grassy foliage is dense on a spreading clumping evergreen perennial. 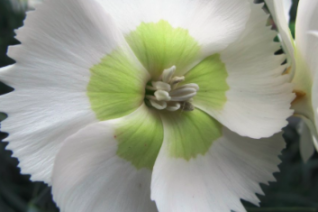 In May/June 8″ stems support single 1″ wide heavily pinked (jagged petal edges) that are white with a wonderful green zone in the center. Heavily scented of cloves- amazeballs. Full sun and well drained soil with light summer water. Average to rich soil. Excellent border perennial, rock garden subject, cutting garden flower. Excels on slopes. Long lived. 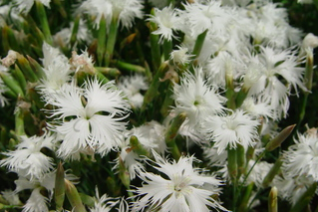 We love this selection of Dianthus that includes masses of white flowers with a bold maroon eye and tight handsome foliage. The incredibly fragrant flowers appear from April to frost- repeating quickly if spent flowers are removed. Good blue foliage is handsome at all times forming a dense dome. To 8″ tall for full sun and rich, well drained soil with light but consistent summer water. Great color echos can be achieved when planted in concert with purple foliaged plants. Cute, fragrant cut flower. One of the best re-blooming pinks.